It's hard, if not impossible, to let a day go by without being impacted in some way by small businesses. Small businesses are at the heart of the communities in which we live and play. Just think about all the retailers, vendors and service providers in your town or city. How often do you interact and/or engage with them, or hear about them in the media? Here at STRADEGY.CA we talk about small businesses all the time. In fact small businesses are the reason our small business exists. But what exactly does it mean to be a small business in Canada? Is it based on the number of employees a business has? The annual revenue of a business? Do a quick search online and you'll find varying definitions. In this post we'll establish a definition of what it means to be a small business in Canada and look at some of the supporting facts and figures. This way when we talk about small business here on stradegy.ca you'll know exactly what our perspective is and where we're coming from. 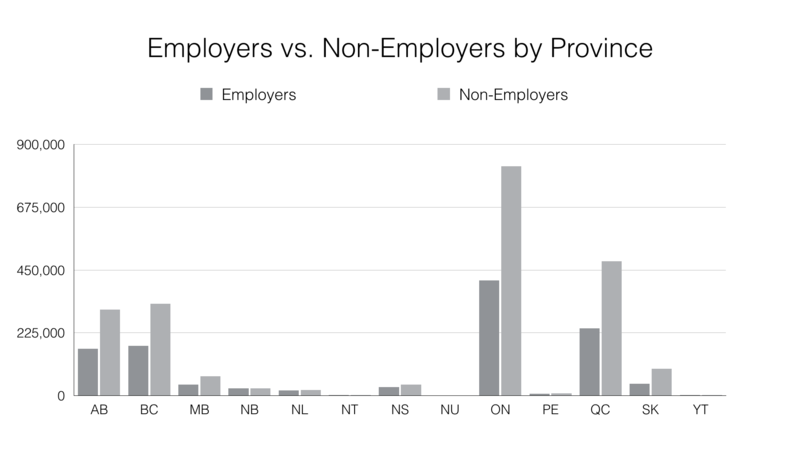 There is much talk about how small business should be defined, but we like the simplicity of Industry Canada's definition - firms that have fewer than 100 paid employees. 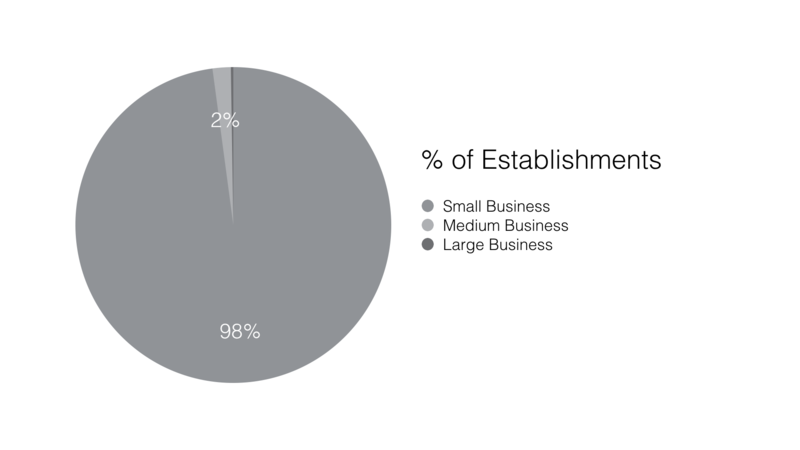 As you can see in the chart below, small businesses make up the majority of business establishments in Canada. We'll take a look at some of the supporting data in a minute. Before we dive-in and take a closer look at the Canadian small business segment, let's first take a look at Canada's business establishments as a whole. As of December 2014 There were 3,369,030 business establishments in Canada. 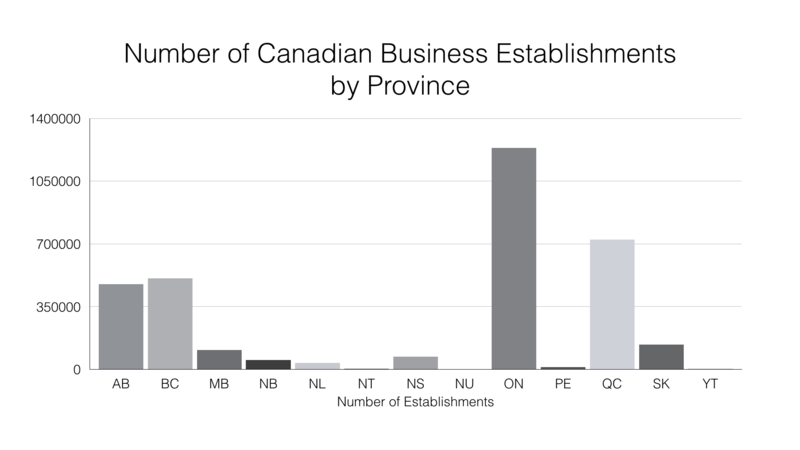 The chart below shows a breakdown of business establishments by province. Industry Canada categorizes these establishments by employment type - Employers and Non-Employers. Employers are establishments with at least one person on payroll. Non-Employers are establishments which have no traditional payroll and consist of owner-operated businesses and businesses with part-time workers and contracted workers. The majority of business establishments in Canada are Non-Employers which represent 65.4% of all establishments. Employer establishments that have one or more paid employees make up the remaining 34.6 percent of Canadian establishments. According to Industry Canada there are 1,141,351 small business employers in Canada. 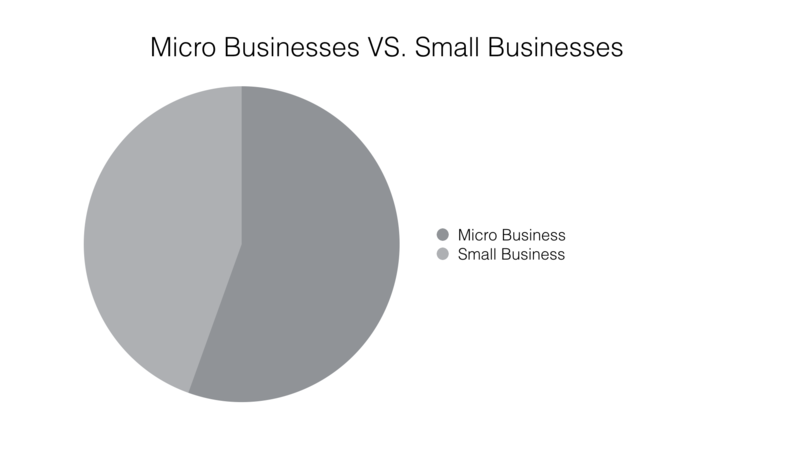 Industry Canada actually breaks small businesses down into two categories - Micro and Small. Micro Businesses are those that have between 1 and 4 paid employees and Small Businesses are those that have between 5 and 99 paid employees. While it is insightful to segment the data into these two categories as you'll see below, they are as a whole, all considered small businesses. As noted above, micro businesses are just a subset of small businesses, and for all intents and purposes are considered small businesses. However, it is interesting to segment micro businesses because they represent such a large portion of Canada's business establishments. 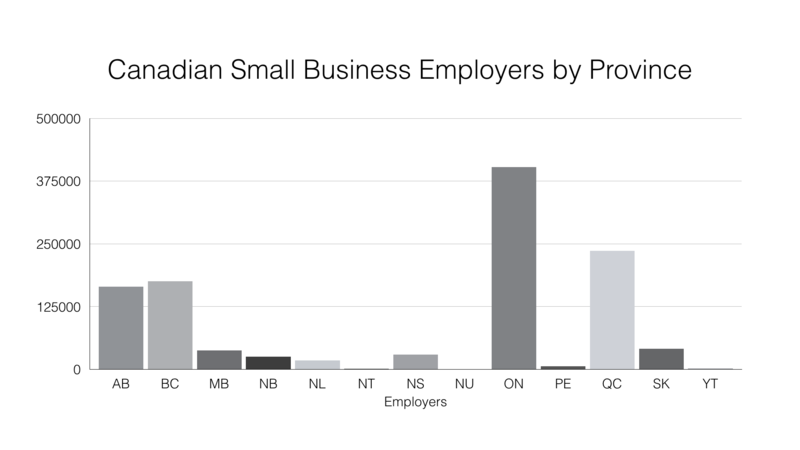 As you can see in the chart above, micro businesses (1 to 4 paid employees) account for 54.3% of all employer business establishments in Canada (633,240 establishments in total). Small businesses (5 to 99 paid employees) account for 43.6% (508,111 establishments in total). 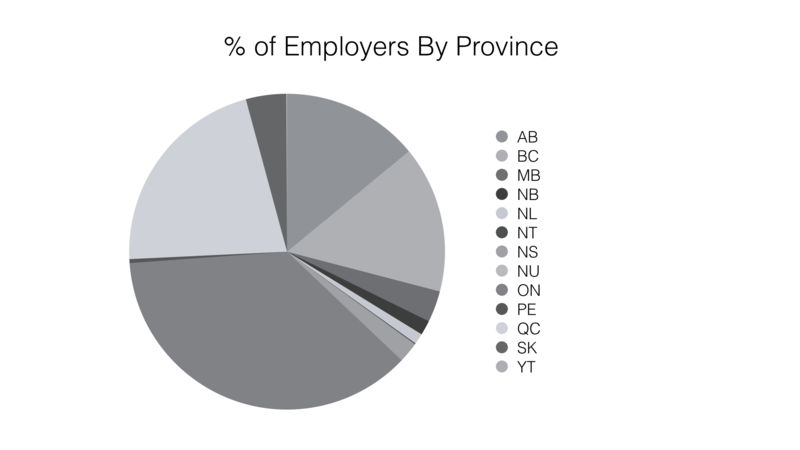 Together they account for 97.9% of Canada employer based businesses. Medium Businesses (100 to 499 paid employees) account for 1.9% and Large Businesses (500+ paid employees) account for 0.3%. Small businesses are a part of our daily lives here in Canada. They drive Canada's economy and more importantly, our local communities. As small business owners, lets be proud of the contributions we make to our local communities and country as a whole. As consumers, lets take the initiative to support our local small businesses. Afterall, they are our family, friends, and neighbours. So there you have it - Canadian Small Businesses defined, supported by some interesting facts and stats. Small businesses are defined as ...firms that have fewer than 100 paid employees. Source: Data presented in this post was compiled from Industry Canada, December 2014. Visit Industry Canada to view the raw data and notes.